Ganglion cysts, also known as Bible cysts or Bible bumps, are small, round sacs or lumps filled with a viscous synovial fluid. The size of the lumps can range from pea-size to nearly an inch in diameter. They usually form over a joint or tendon in the fingers, wrists, ankles or soles of the feet. The most common symptoms of a ganglion cyst are pain and discomfort along with tingling sensations, numbness or muscle weakness. Depending on the size, these cysts may feel firm or spongy. The exact cause of developing ganglion cysts is not known, but any joint or tendon irritation or mechanical changes may trigger this problem. These cysts are most common in people between the ages of 15 and 40, particularly women and gymnasts who repeatedly apply stress to the wrist. In rare cases, they can occur in children younger than 10 years old. People suffering from osteoarthritis or those having a joint or tendon injury are also more likely to develop this problem. Often, ganglion cysts heal with simple medications and home treatments, but in some cases surgical removal is considered the best option. 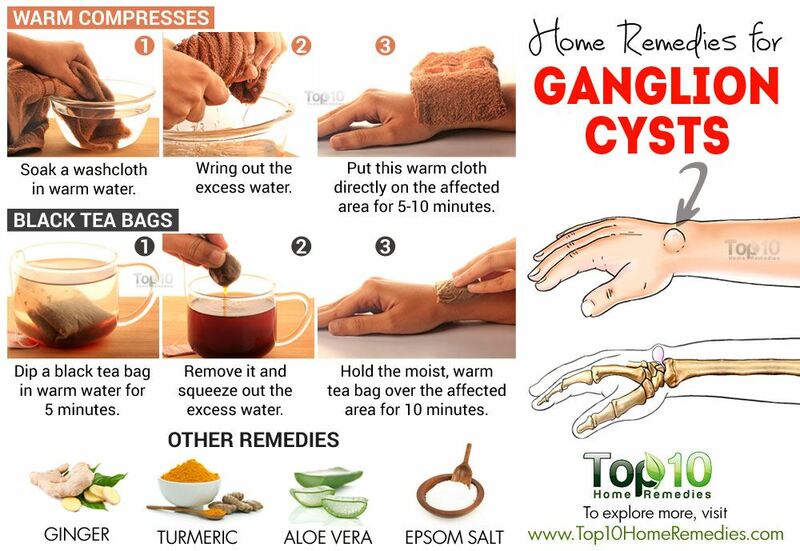 Here are the top 10 home remedies for ganglion cysts. You can reduce the discomforts associated with a ganglion cyst with regular use of warm compresses. It will increase blood circulation to the affected area and promote fluid drainage. It will also reduce pain and swelling. However, warm compresses will not prevent the growth of a cyst. Put this warm cloth directly on the affected area for 5 to 10 minutes. Repeat 3 or 4 times daily until the cyst is gone. The acidic property of black tea helps heal a ganglion cyst and prevents it from getting worse. The tea’s anti-inflammatory nature also provides relief from pain and swelling. 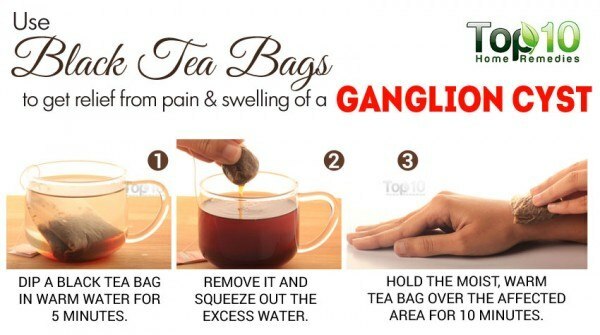 Hold the moist, warm tea bag over the affected area for 10 minutes. Repeat a few times daily for several days. Frankincense oil is an effective astringent that can help reduce the size of a ganglion cyst and prevent it from recurring. It can also ease the pain. Cover it with a soft, clean bandage. Do this once daily, using a clean bandage each time, until the size has reduced. Continue applying the oil for a couple of weeks to reduce the risk of recurrence. 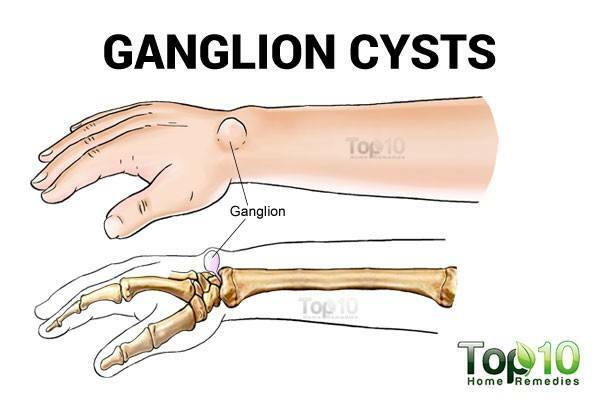 If your ganglion cyst is causing unbearable pain, you can use ginger to reduce it. The anti-inflammatory property of ginger helps ease the pain and discomfort. A 2011 study published in The Journal of Fitoterapia suggests that ginger is an anti-inflammatory agent that blocks Cox-2 activity, which likely causes pain. Drink homemade ginger tea 2 or 3 times daily or include more ginger in your cooking. To make ginger tea, cut an inch of fresh ginger root into slices and simmer it in a cup of water for 10 minutes. Alternatively, you can take ginger supplements. Always consult a doctor before taking a supplement. You can also use turmeric to relieve pain due to a ganglion cyst. This herb has positive effects on inflammation and pain. A 2009 study published in The International Journal of Biochemistry & Cell Biology suggests that curcumin in turmeric exhibits anti-inflammatory activity by regulating cytokines, redox status, protein kinases, adhesion molecules, enzymes and many transcription factors associated with inflammation. Apply some fresh turmeric juice directly on the affected area 2 or 3 times daily for several days. Alternatively, you can take this herb in supplement form, daily. Always consult a doctor first, as it can increase the risk of bleeding if you take blood-thinning medications. Echinacea increases the level of the properdine chemical in your body, which stimulates your immune system and helps shrink the ganglion cyst. A 2002 study published in The Journal of Alternative Medicine Review notes that use of echinacea increased production of properdine. Buy over-the-counter echinacea ointment and apply it topically to the cyst. Repeat 2 or 3 times a day until you get rid of it completely. You can also drink a cup of echinacea herbal tea once or twice daily for not more than a week. Note: People who have an autoimmune disorder should not take this herb internally. 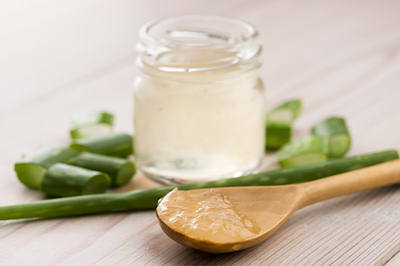 The anti-inflammatory property of aloe vera can stimulate healing of a ganglion cyst. It also helps reduce pain and swelling. Arnica is an excellent anti-inflammatory agent that can help reduce pain, swelling and inflammation. It also increases blood circulation, which helps the cyst heal faster. 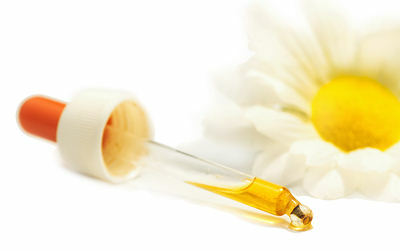 Dilute arnica essential oil in an equal amount of olive or coconut oil. Apply it on the affected area and massage gently. Put a bandage over the area. Do this 2 or 3 times daily for several days. Alternatively, buy an over-the-counter arnica cream or lotion, and apply a thin layer of it to the affected area a few times daily. 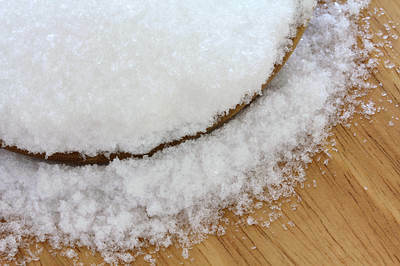 Epsom salt is a wound-healing agent that will help reduce and heal the cyst within a few days. It will also relieve associated pain and inflammation. Mix 1 tablespoon of Epsom salt in 1 to 2 cups of warm water. 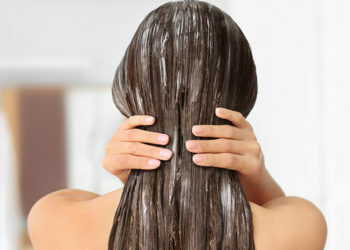 Soak the affected area in it for 20 to 30 minutes. Repeat once daily for several days. Alternatively, combine ½ teaspoon of Epsom salt, 1/3 cup of warm glycerin and about 1/8 teaspoon of borax in a bowl. Mix the ingredients thoroughly until all substances are dissolved. Use a cotton swab to apply it on the affected area, then put a bandage over it. Repeat twice daily for a few days. To minimize pain and swelling due to a ganglion cyst, eat more foods that have anti-inflammatory properties. 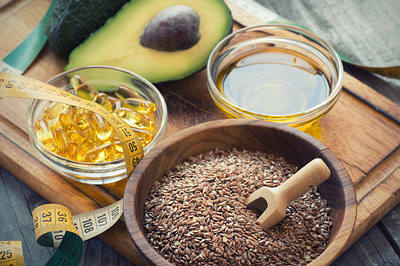 Some good anti-inflammatory foods are salmon, flaxseeds, avocados, ginger, turmeric, olive oil, tart cherries, walnuts, blueberries, blackberries, sweet potatoes and spinach. Also, avoid eating or drinking inflammatory foods like white-flour products, white rice, sugary foods, soda and foods rich in saturated fats. Be careful not to hit the cyst with any heavy object, as it can damage the skin. Do not try to pop the cyst by puncturing it with a needle, as this can lead to infection. If the cyst is on your wrist or hand, avoid repetitive movements of that area. If the cyst is on your foot, try to wear shoes that don’t touch it. If needed, wear a splint or brace to temporarily immobilize the affected joint. Make sure you consult your doctor if the size of the cyst is increasing rapidly or causing pain for a long time. Do not remove a ganglion cyst on your own using a needle, scalpel or scissors. can you explain more the method? I just used the “Bible Therapy” method. Just take hardcover book and smack the bump with it a few times with increasingly hard strikes… start easy, then work up from there. When you feel the bump start to go down in size, i.e. the fluid-filled sack burst and the fluid can drain back into the body, massage the area until the bump is gone. If it matters, I used a copy of Freakonomics and not an actual Bible. It was gone in 30 seconds, which seems a better method than surgery or taking some kind of homeopathic placebo. Steve your theeory is awesome.I read all treatment tried at home but finally it is gone by just hard strikes of firm booklet. I had a cyst on the back of my hand that was quite sensitive. After a month of immobilizing my wrist and using frankincense oil on sticky plasters, I accidentally knocked the gangleon on a (rubber) mat during my aikido lesson. It hurt for about 10 seconds (really no worse than knocking any joint) and it was gone. I wish I’d just whacked it to start with. Oh my gosh, does it hurt bad?? I have one on my trigger finger and low pain tolerance ? But this thing has to go. I started taking Turmeric paste and applying frankincense today. I used a beverage coaster made of stone. It took one strike and was completly gone. Seems that the thickness of the coaster was perfect in striking the cyst. Yep, this worked, thank you so much Steve! Steve’s “Bible Therapy” worked. After being freaked out about the cyst it was a perfect fix. I used my phone (which has a book cover like case) to give one I found on my wrist just a couple hard taps… worked wonderfully! Thank you Steve! Comment: it’s much eduative, ‘ve learnt alot from this website. thanks you Steve. I have my ganglion cyst for almost two years and Im planning for surgery, but my friend told me to take Vitamin C a week ago they reduce the volume until perfect the cyst is totally gone . Some doctor told me to be careful with the book hitting method . Maybe good to expolre other methods such as taking Frankincese , Oil massage and Black tea treatment that will add other value to related inflammatory treatments making it more holistic. in nature . Does the bible method hurt? Told about the “Bible method” by my GP, I have one on the top of my foot! However the GP also advised that due to where it was I was more lucky to break a few bones while doing it!! Mine occurred due to twisting the foot awkwardly while walking, any suggestions to get rid of it. It is a soft one and cannot be drained so told surgery is the only fix please help as becomes painful at times. Freeze it with an ice cube held with pressure. It freezes, it pops it drains away. ICE CUBE METHOD. Freeze it with an ice cube held with pressure. It freezes, it pops it drains away. Hi is there a certain kind of frankincense oil to use, anybody. Compress again later and repeat. We’ll see. Repeat process later on today and hope to get the rest out. Even though the bible therapy works doctors suggest it should be avoided because after hitting the bump the fluid will still remain inside and there may be chances of getting those bumps again. The home remedies also mentioned not to hit the cyst with heavy objects. Years ago I went to doctor for ganglion on my wrist. He was an old timer and said there were 2 choices: surgery or the thump method. I opted for thump so he grabbed his PDR from the shelf and smacked my wrist. Worked like charm. Just tried the smash it with a book method for one on top of my wrist! Didn’t have to hit it too hard, it was gone immediately! Massaged the area for a few minutes after to get all the fluid out. My wrist looks normal again. Mine popped once. It eventually came back bigger and way more painful. Will try these home remedies before seeing a doctor. how exactly you do the bible method? I have one on my wrist is big pls help! Have one in the joint of the tip of my little finger. Ouch! I have a small one (pea sized) in the joint where my ring finger meets my palm… it really hurts and it’s hard for me to grasp things. Any suggestions? I have 2 ganglions in both of my wrists removed through surgery, one has never returned. I have however just healed from the other wrist surgery to remove it and now after the swelling has reduced it appears I have another ganglion in the same wrist…unsure how it was missed but it is now going to cost more to have this one checked out. I will be trying these home remedies and seeing if they help. My husband just hit it with a cookbook and it was gone immediately. It hurt for like 10 seconds and them he massaged it and it feels great. The pain of the book smacking wasn’t as bad as the pain from the cyst. Plus he was able to get a little joy out it. LOL. thanks for the recommendation! I’ve tried hitting the one on my foot with a book many times, but it’s still there, and bigger than ever. I tried taping a coin to it over night, but that hasn’t helped either. Any other remedies I could try? I tried a frying pan and it works! Turpentine on gauze held on it?…. I hit mine with a good sized book, too! Did the trick! I still used a hot tea bag compress to reduce the inflammation and reduce and pain, but really not uncomfortable. I have a couple of small cyst in my wrist. I heard of the Bible method and was reading about treatment for them. Since I was reading this on my Cell Phone and had it in my hand. I decided to whack it with the back of my phone! It was pretty handie. Lol! It instantly helped the pain! Some people can’t stand the thought of hitting the small bones in the wrist. But it was worth it! Cortisone shot will make it go away permanently. No surgery necessary or may pop on own! I used a long square eraser on mine on the underside of my wrist . I held it tightly in place with an ace bandage . Tight but not so tight it cuts your circulation off . Wore it like that for almost two days . Worked like a charm . But now i have a large one on top of my foot . Gonna try it on that one . Hi I have a cyst on my foot. So I noticed mine about two months ago and it was getting bigger and slightly painful at the top of my wrist. Want to join the thanks to Steve for his explanation of the book method. Took a few tries to work up the courage to hit progressively harder and hard enough to smash it. Didn’t use a book, it was actually a rectangular Bluetooth speaker lol. Instantly went down, with a bit of swelling after massaging. Taped a quarter over it, going to sleep like this and hopefully be good in the morning. Thanks everyone on here for sharing, was getting worried about this. I have a cyst on the wrist, exactly at the picture. I got this when i worked from steel molding company, back 5 years ago. I had it about 5 centimeters in diameter now. Sometimes it hurts especially when winter. I cannot do some work out too like push up, i have difficulties to lift heavy objects. Its too damn! And very annoying. When i came to dr. They do a xray, but nothing found. Anyway, does any one know what kind of apparatus they have to use to be able to determine if this is a gallion cyst or not? And does this surgery or book method can be possibly heal this although it was 5 years old now? Thanks in advance! I have a ganglion cysts on my index finger, it has pulled the tendon in that area, is there any home remedies I can use to get rid of this lump ? also on Steves method it is good to put a quarter on cyst helps direct the blow to cyst only. good method.